Gastroesophageal reflux disease (GERD) is defined as the presence of symptoms (e.g. ‘heartburn’) or injury of the esophageal mucosa (e.g. esophagitis, esophageal stricture, Barrett’s disease) as a result of reflux of stomach contents into the esophagus. GERD affects 10-20% of the population at any age. GERD occurs as a result of dysfunction of the lower esophageal sphincter, which is a valve mechanism at the junction of the esophagus and stomach. 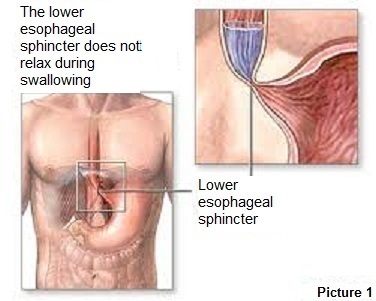 This sphincter prevents the reflux of gastric contents up into the esophagus (Picture 1). Causes of lower esophageal sphincter dysfunction include diseases such as obesity and hiatal hernia as well as dietary and lifestyle factors (e.g. caffeine, alcohol, smoking). Temporary lower esophageal sphincter dysfunction also occurs during pregnancy. ‘typical’, such as heartburn and regurgitation of undigested food. These are the commonest GERD symptoms and respond to surgical treatment in more than 95% of patients. ‘atypical’, such as hoarseness, asthma, aspiration pneumonia, laryngitis, pharyngitis. These are less common GERD symptoms, are often caused by diseases other than GERD and are less likely to respond to surgical treatment. Patients with typical GERD symptoms (e.g. heartburn) will often receive a course of medical therapy as a means of diagnosis, without prior diagnostic tests. Diagnostic testing for GERD is indicated when the diagnosis is in question (e.g. atypical symptoms only) and when surgical treatment is being considered. Esophagogastroscopy: helps diagnose strictures, esophagitis, Barrett’s disease, hiatal hernia as well as other diseases unrelated to GERD such as gastritis and peptic ulcers. 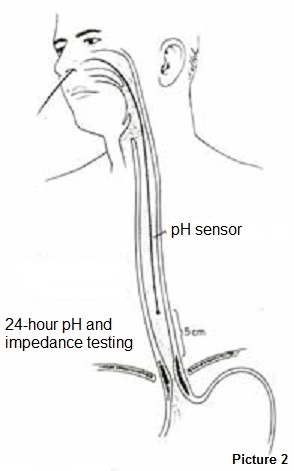 24-hour pH and impedance testing: requires placing sensors into the esophagus that detect pH changes and flow of gastric fluid. It is the most accurate test for GERD diagnosis (Picture 2). 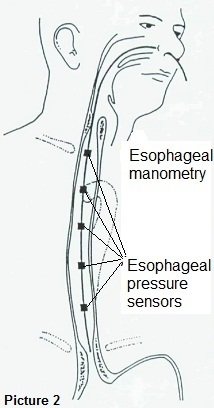 Esophageal manometry: evaluates esophageal muscle function, upper and lower esophageal sphincter function (Picture 3). Esophagram (‘barium swallow’): involves swallowing liquid contrast material and using x-rays to diagnose hiatal hernia, esophageal diverticula and strictures. A. Conservative: all GERD patients are advised to avoid large meals, stop smoking and avoid excessive caffeine and alcohol consumption. Obese patients benefit from losing weight. Additional conservative measures include not eating 3 hours before bedtime, as GERD is exacerbated in the supine position. In most patients, conservative measures help improve GERD but are inadequate for complete symptom control. B. Medical: patients with persistent symptoms are prescribed acid suppression therapy with proton pump inhibitors (e.g. Losec®, Nexium® etc), histamine receptor clockers (e.g. Zantac™) or a combination of these drugs, initially for 6-8 weeks. These medications are the mainstay of GERD treatment and reduce or stop stomach acid production, resulting on improvement or resolution of GERD symptoms and esophageal injury (esophagitis, Barrett’s disease) in 85-90% of patients. Lower esophageal sphincter dysfunction remains unchanged but refluxing fluid is converted from acidic to non-acidic. Disadvantages of medical treatment include continued non-acid reflux with unknown long-term effects, side-effects (nausea, diarrhea, abdominal pain, etc), financial cost. C. Surgical: Surgical treatment of GERD aims to create a new lower esophageal sphincter mechanism, which will completely and permanently cure GERD. 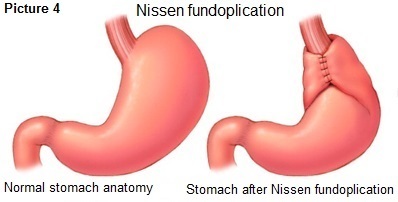 This is usually achieved by wrapping the uppermost part of the stomach aroung the lower esophagus in a 360° fashion (Nissen fundoplication, Pictures 4 and 5A). 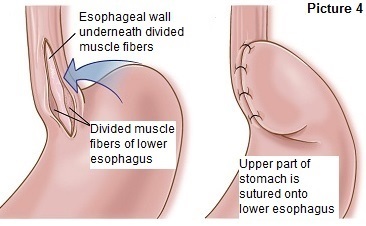 In patients with reduced esophageal muscle function or with difficulty swallowing, a partial fundoplication (Dor, 180°, Picture 5C) or (Toupet, 270°, Picture 5D) is created. A hiatal hernia, if present, is fixed at the same operation. In patients with body mass index over 35, gastric bypass surgery is recommended instead of fundoplication in order to treat obesity and GERD. Indications for surgical treatment: The main indication for surgery is failure of medical therapy due to persistent symptoms or esophageal injury. Additional indications are medication intolerance and GERD in young patients who do not wish to take life-long medications. Contraindications to surgical treatment: Coexisting medical conditions that increase the risk of complications, such as heart and lung disease and some types of prior esophageal or stomach surgery. Technique: Antireflux surgery is performed laparoscopically using 5 upper abdominal incisions, each 5-10 mm long. Patients with a history of prior upper abdominal operations can undergo laparoscopic surgery. Advantages of laparoscopy over ‘open’ surgery include reduced pain, faster recovery, improved cosmetic results and avoidance of wound complications (wound infections, hernias). Recovery: Most patients are discharged from hospital 1-2 days after surgery and feel well enough to ambulate on the day of surgery. Diet is restricted to liquids for 3 days and pureed foods for an additional 3 days. Paracetamol and non-steroidal analgesics are usually adequate pain treatment and are needed for approximately 1 week in most cases. Lifting heavy objects (> 5 kg) is to be avoided for 6 weeks after surgery. Results: Approximately 85% of patients remain symptom-free and do not require anti-reflux medications 5 years after surgery. An additional 10% of patients remain symptom-free on anti-reflux medications and the remaining 5% of patients will experience partial or complete symptom relapse within 5 years. The esophagus is a tube-like structure that runs from the mouth to the stomach. It has a muscular wall that actively pushes food towards the stomach. Achalasia is a disorder of unknown cause in which (1) esophageal muscle fails to push food down towards the stomach and (2) the sphincter mechanism at the lower esophagus fails to relax in order to allow food to enter the stomach (Picture 1). Achalasia affects patients between the ages of 30 and 60 years, has gradually worsening symptoms and causes the esophagus to dilate over many years. The symptoms of achalasia include difficulty swallowing solids and liquids (foods gets ‘stuck’), regurgitation of undigested food, foul-smelling breath, central chest pain. Esophageal pressure measurement (manometry) is necessary to diagnose achalasia (Picture 2). It involves inserting pressure sensors into the esophagus to measure esophageal muscle and sphincter function during swallowing. Esophagoscopy (‘upper endoscopy’) and esophagography (x-rays of the esophagus after swallowing liquid contrast) are also helpful. Medical: drugs have a very limited role in the treatment of achalasia due to lack of efficacy and frequent side-effects. They are only used when a patient is not fit or willing to undergo other treatments. Esophageal dilation: causes controlled disruption of lower esophageal muscle fibers thereby palliating lower esophageal sphincter dysfunction. Improvement of symptoms lasts for a few months or years. It carries a 2% risk of esophageal rupture and a 40% risk of gastroesophageal reflux disease. Botox injection: the lower esophageal sphincter is injected with botulinum toxin, helping it relax. Approximately 50% of patients will relapse within 6 months. Surgery is the mainstay of achalasia treatment. 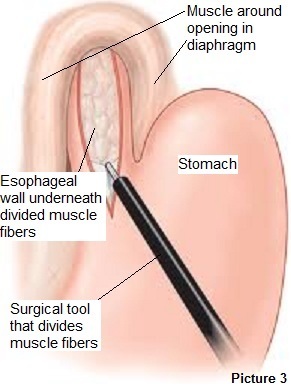 At operation (Heller myotomy), muscle fibers of the lower esophagus are divided and separated to allow esophageal contents to empty into the stomach (Picture 3). 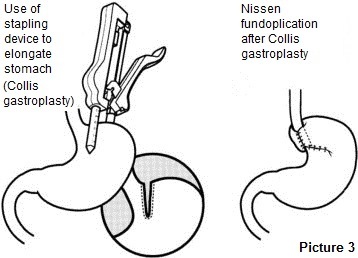 A Heller myotomy is always combined with wrapping the uppermost part of the stomach around the divided muscle fibers (Dor fundoplication) to prevent gastroesophageal reflux (Picture 4). This operation is performed laparoscopically using 5 small upper abdominal incisions. Laparoscopic surgery has the advantages of reduced postoperative pain, better cosmetic results, earlier return to daily activities and avoidance of incisional complications (infection, hernia). Recovery after surgery: Most patients are hospitalized for 1-2 days and feel well enough to ambulate on the day of surgery. Diet is restricted to clear liquids for 3 days and then pureed foods for an additional 3 days approximately. There are no long-term dietary restrictions. Pain after surgery responds to simple analgesics such as paracetamol and non-steroidal analgesics. Lifting weights over 5 kg is avoided for 6 weeks. Results: approximately 95% of patients remain asymptomatic 5 years after surgery. Complications: Serious complications are rare. Approximately 10% of patients will experience symptomatic gastroesophageal reflux that responds to medications. Barrett’s disease is a change in morphology of the cells lining the innermost layer of the esophagus. It is a complication of gastroesophageal reflux disease (GERD) that affects approximately 2% of the general population or 10% of patients with GERD, even if no symptoms of GERD are present. The significance of Barrett’s disease is that it can progress to cancer in about 0.5% of patients annually. Barrett’s disease is reversible, i.e. the esophagus can return to normal if protected from stomach acid. 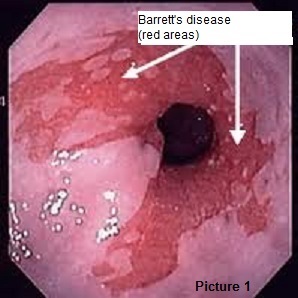 Barrett’s disease has a characteristic salmon-red appearance on esophagoscopy esophagoscopy (‘upper endoscopy’) (Picture 1). However, its diagnosis is not based only on this appearance, but on microscopic examination of biopsy specimens. In addition, biopsies will show if dysplasia is present in addition to Barrett’s disease. Dysplasia can be low- or high-grade and it signifies a further step in the progression to cancer, especially if high grade dysplasia is present. To diagnose Barrett’s disease, esophagitis (esophageal inflammation from acid exposure) has to be treated with acid suppression for a 6-8 weeks prior to biopsy. Who needs endoscopy to diagnose Barrett’s esophagus? The incidence of Barrett’s disease is highest in men over the age of 50 with chronic GERD, especially if obese and actively smoking. Expert groups (American Gastroenterological Association, American Society for Gastrointestinal Endoscopy, Society for Surgery of the Alimentary Tract) recommend endoscopic screening for Barrett’s disease in patients with the above risk factors. The probability of Barrett’s disease developing in patients lacking those characteristics is extremely low and therefore endoscopy is not indicated. 1. Esophageal protection from acid exposure to prevent dysplasia and promote regression of Barrett’s disease. (a) Drug therapy: all patients with Barrett’s disease are initially treated with acid suppression medications. However, 15-80% of patients will have continued esophageal exposure to acid despite such therapy. 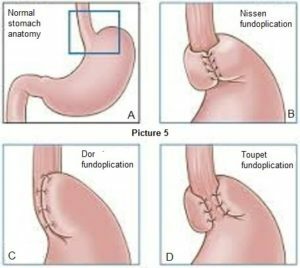 (b) Surgical therapy: Laparoscopic fundoplication creates a new valve mechanism at the lower esophagus that prevents acid reflux (Picture 2). Studies have shown that surgical treatment of reflux is at least as effective as acid suppression in promoting regression of Barrett’s. Similarly, surgery is at least as effective in reversing dysplasia when compared to medical therapy. 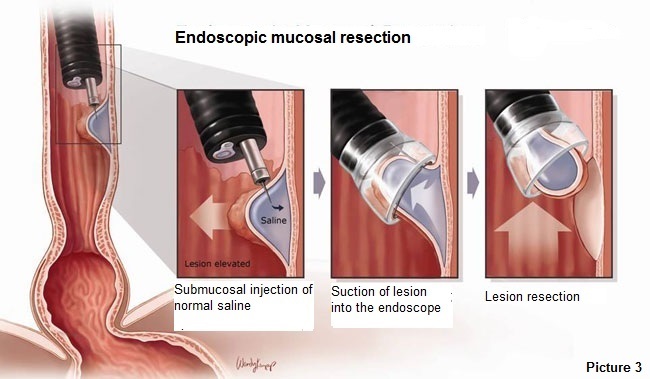 Endoscopic mucosal resection: resection of small areas of nodular change; resected tissue undergoes microscopic examination for cancer and dysplasia (Picture 3). Endoscopic radiofrequency ablation: areas of dysplasia are ablated using heat and are replaced by normal esophagus in more than 80% of cases. This technique can be used to ablate part (HALO 90™) or all (HALO 360+™) of the esophageal circumference, depending on the extent of dysplasia (Picture 4). 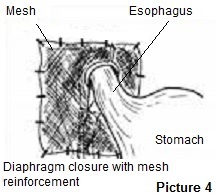 These techniques can reduce the need for esophagectomy (esophageal resection), an operation with risk of significant complications. However, esophagectomy remains the only option in some patients with dysplastic Barrett’s disease. American College of Gastroenterology Updated Guidelines 2008 for the Diagnosis, Surveillance and Therapy of Barrett;s Esophagus. American Gastroenterological Association Medical Position Statement in the Management of Barrett’s Esophagus. Society of American Gastrointestinal and Endoscopic Surgeons Guidelines for Surgical Treatment of Gastroesophageal Reflux Disease. British Society of Gastroenterology Consensus Statements for Management of Barrett’s dysplasia and early-stage oesophageal adenocarcinoma. British Society of Gastroenterology Guidelines for the diagnosis and management of Barrett’s columnar-lined oesophagus. American Society for Gastrointestinal Endoscopy. The role of endoscopy in Barrett’s esophagus and other premalignant conditions of the esophagus. Shaheen NJ, Sharma P, Overholt BF, et al. Radiofrequency ablation in Barrett’s esophagus with dysplasia. N Engl J Med. 2009;360:2277-88. Oelschlager BK, Barreca M, Chang L, et al. 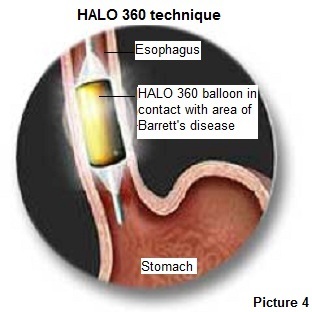 Clinical and Pathologic Response of Barrett’s Esophagus to Laparoscopic Antireflux Surgery. Ann Surg. 2003;238:458-64. Chang EY, Morris CD, Seltman AK, et al. The effect of antireflux surgery on esophageal carcinogenesis in patients with Barrett’s esophagus. Ann Surg 2007; 246:11-21. Parrilla P, Martinez de Haro LF, Ortiz A, et al. Long-term results of a randomized prospective study comparing medical and surgical treatment of Barrett’s esophagus. Ann Surg 2003; 237:291-8. Hiatal hernia (HH) is a protrusion of abdominal contents into the chest through the opening in the diaphragm (‘hiatus’) normally occupied by the lower esophagus (Picture 1). It is caused by a combination of weak diaphragmatic muscle at the hiatus and a pressure difference between the chest (low pressure) and abdominal (high pressure) cavities, that pushes abdominal organs into the chest. The prevalence of HH is about 10% at age 40 and increases to about 50% in people aged over 70 years. From the four types of HH shown above, type I hernia is the commonest (95% of total) and may not cause symptoms if small. In a type I hernia, the lower esophagus and part of the stomach move into the chest. 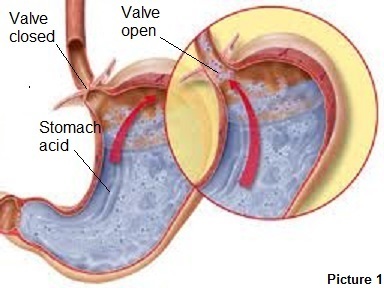 As a result, the valve mechanism of the lower esophagus that prevents stomach acid and food from moving up towards the esophagus fails, causing symptoms of gastroesophageal reflux (heartburn and regurgitation). 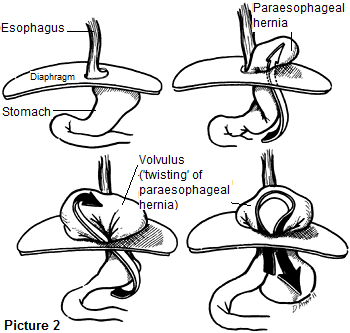 Type II, III and IV hernias are paraesophageal hernias. Type II hernias are rare; as seen, the lower esophagus remains in the abdomen while part of the stomach herniates next to it. 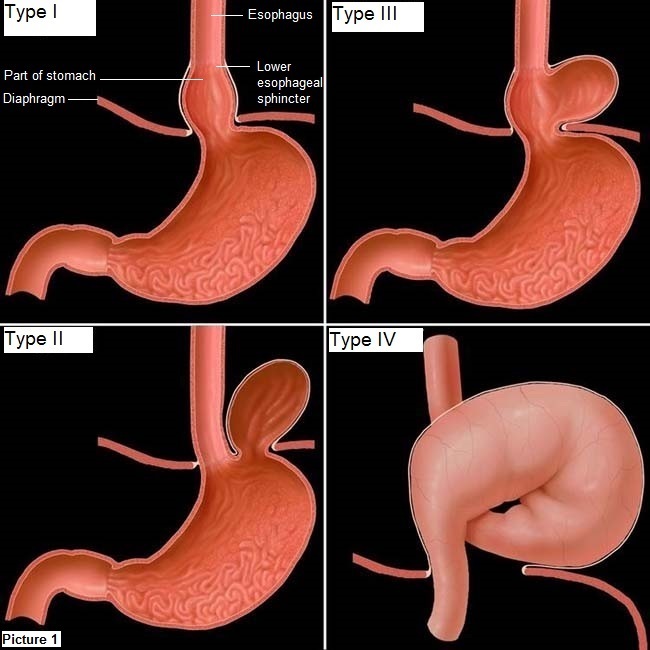 Type III hernias are the second commonest; the lower esophagus and a significant part of the stomach are in the chest. Type IV hernias evolve from untreated Type III hernias, when over time the entire stomach and sometimes other organs move into the chest. Patients with type III and IV hernias often have symptoms of gastroesophageal reflux. In addition, many will feel chest pain/pressure and shortness of breath after a meal, as a full stomach will push against surrounding chest organs. Some patients with type III and IV HH will suffer acute complications such as volvulus (hernia contents twisting around themselves) or strangulation (compromised blood supply of hernia contents) (Picture 2). These patients will have acute chest and/or abdominal pain, inability to swallow and vomit. HH can be an incidental finding of an imaging study performed for unrelated symptoms (e.g. chest xray, CT/MR scan of chest/abdomen, contrast swallow study). A CT scan will accurately define the anatomy and contents of a HH. Esophagoscopy (upper endoscopy) can be performed to demonstrate bleeding from mucosal ulcers or in the setting of acute symptoms to examine for viability of the esophagus. Conservative/medical: a small percentage of patients who truly lack symptoms are at very low risk of complications and hence do not require surgery or other treatments. Elderly patients with reflux symptoms and significant comorbid medical conditions are treated with acid suppression. Surgical: with the above exceptions, surgery is always indicated to control symptoms and prevent acute complications. to reconstruct the non-functioning valve mechanism that prevents gastroesophageal reflux. In patients without reflux and in those having emergency surgery, the stomach is sutured to the diaphragm and lower abdominal wall. Recovery: after elective surgery, patients are hospitalized for 2-4 days. Depending on repair technique, clear liquids are allowed 1-2 days after the operation. Ten to 15 days after surgery, all dietary restrictions are lifted. Pain responds to mild analgesics that are usually required for 1 week approximately. Lifting more than 5 kg is avoided for 2 months. Complications: The commonest complications (affecting 20% of patients) are respiratory (e.g. pneumonia). Serious complications during surgery are rare. Ballian N, Luketich JD, Shende M, Levy RM, Awais O, Winger D, Jobe BA, Weksler B, Schuchert MJ, Landreneau RJ, Nason KS. A clinical prediction rule for morbidity and mortality after giant paraesophageal hernia repair. J Thorac Cardiovasc Surg 2013;145:721-9. Ballian N, Schuchert MJ, Luketich JD. Minimally Invasive Esophageal Procedures. Βιβλίο: Kaiser LR, Kron IL, Spray TL, eds. Mastery of Cardiothoracic Surgery. Philadelphia: Lippincott, Williams and Wilkins; 2013.